"Hear that?" the May email read as the sound of thunder still echoed among the concrete and steel of Manhattan's tall buildings, "It's the sound of baby turkeys dying." The email had just popped into my inbox from Gerry Bethge, executive editor of Salt Water Sportsman. Despite his current job where a person would think all he does is fish, the dude is a total turkey hunting fanatic. He hunts in both New York and Massachusetts where poult survival has been lackluster the last couple of years. The storms hitting New York City on the late spring afternoon were part of a two-week barrage much of the Northeast suffered right about the time turkey's should have been hatching. Generally, rain and colder-than-normal days spell doom for days-old turkey poults, whose body temps plummet in the conditions. As a result they simply die. For fall hunters, that can spell a bleak fall season coming up, where young jakes and jennies are often part of the excitement. For spring hunters, look for a bummer season two years away. Poor poult production in one year means that there won't be as many 2-year-old gobblers two years later. The 2-year-olds often provide the most gobbling and work best to the call. Either way, hunters want to consistently see a lot of little birds trailing hens come mid to late June. By then, poults have grown larger, can often fly and are better able to survive bad weather and predators meaning their odds to reach adulthood are extremely high. In conversations I've had with a few hunters of late, the word so far is that there has been decent production in Pennsylvania and actually, in New York as well, where the storms where such a big concern. In other parts of the Northeast, initial reports are not so rosy. There is even some word of concern arising out of the Ozarks of Arkansas and Missouri where production was said to have suffered. Virginia appears to have faired okay according to The Roanoke Times outdoor editor Mark Taylor who writes, "Many hunters are already thinking ahead to 2008 as they try to gauge how this spring's hatch went. (State turkey biologist Gary) Norman said he's getting decent brood reports. Heavy prolonged rain can cause high poult mortality. 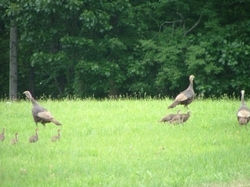 But Virginia didn't have much rain until the end of June, when many poults should have been old enough to handle it." That wasn't the case in 2005 though when the state's poult production was down, a fact that has some Old Dominion hunters (including myself) a little concerned. On a side note though, Virginia hunters can celebrate the past spring's harvest totals, which saw a whopping 20 percent increase over the previous season's totals. Turkey hunters reported 17,195 kills this past spring. Be sure to read all of Taylor's article on the state of Virginia turkey hunting if you live or travel there.